September 20, 2010 - Building on earlier successes this year, the GE Rolls-Royce Fighter Engine Team will initiate testing on its fifth development engine in 2010, executing a test schedule that positions the F136 program for flight testing next year in the F-35 Lightning II Joint Strike Fighter. The new test engine (Engine 008) is installed at GE’s test facility in Evendale, Ohio, working final checkout before initiating tests later in the month. The engine will undergo Conventional Take Off and Landing (CTOL) flight clearance endurance testing and advance the F136 program toward Initial Flight Release next year. Cleared fan aeromechanics through a wide operating range, in support of current testing at both Evendale and the USAF Arnold Engineering Development Center (AEDC) in Tennessee. Reaching maximum augmented thrust and demonstrating consistent, successful light-offs and operability of the augmentor. Accelerated Mission Testing initiated with efforts on Engine 006, with more set to begin in upcoming weeks. Altitude testing progresses throughout the operating envelope. Successful completion of CTOL Common Exhaust System clearance testing, allowing the afterburner to be tested around the full operating envelope, to full maximum A/B conditions. “The F136 engine has reached many major milestones already, proving the capability not only of the design but the entire GE Rolls-Royce Fighter Engine Team. We are all energized and eager to compete in the Joint Strike Fighter program,” said Al DiLibero, President of the GE Rolls-Royce Fighter Engine Team. “We are checking off a new test point or milestone virtually every day, as we move toward flight test. This is an exciting time for the F136 team and these major successes motivate the team to keep reaching for the next accomplishment,” said Mark Rhodes, Senior Vice President of the GE Rolls-Royce Fighter Engine Team. In addition to Engines 007 and 008, Engine 004 recently concluded testing at GE, while Engine 005 tests are under way at AEDC. Engine 005 is the first development F136 engine to test at AEDC. Engine 006 also tested earlier this year and will resume testing in a few months, in Short Take Off/Vertical Landing (STOVL) configuration. Engine 009 is in assembly and will begin testing within a few months. That will make a total of six F136 engines in test in 2010. Production has already begun on Flight Test Engine 041, the first F136 to fly in the F-35 Lightning II aircraft. Final assembly will take place in early 2011, followed by the beginning of acceptance testing by mid-year. 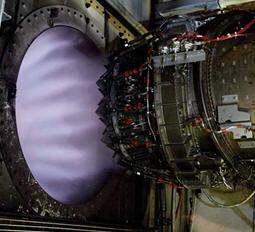 Flight Test Engine 041 is scheduled to take to the skies in the AF-1 test aircraft. Outstanding F136 performance demonstrates the vital role that the engine will play competing in the Joint Strike Fighter program over several decades. The GE Rolls-Royce Fighter Engine Team completed the fifth year of its System Development and Demonstration (SDD) contract with the US Government Joint Program Office. Production will begin in 2012, with customer deliveries scheduled for 2013. The F136 engine is a product of the best technology from GE and Rolls-Royce, two world-leading propulsion companies. The GE Rolls-Royce Fighter Engine Team has designed the only engine specifically developed for the F-35 aircraft, offering extra temperature margin and affordable growth. The F136 engine will enter production in 2012. GE - Aviation, with responsibility for 60 percent of the F136 program, is developing the core compressor and coupled high-pressure/low-pressure turbine system components, controls and accessories, and the augmentor. Rolls-Royce, with 40 percent of the F136 program, is responsible for the front fan, combustor, stages 2 and 3 of the low-pressure turbine, and gearboxes. International participant countries are also contributing to the F136 through involvement in engine development and component manufacturing.